MINI has produced a short video clip called 'Britalian Job' that pays tribute to the famous Italian Job movie and honors the British 2012 Olympic athletes. MINI has produced a video that pays tribute to the original 1969 Italian Job movie and honors British athletes participating in the 2012 London Olympic games this summer. In the original 1969 film of the Italian Job, there was one of the best chase scenes of all time. The film is an icon in Britain and In November 2004, Total Film named The Italian Job the 27th greatest British film of all time. In the movie, three MINIs race through the shopping center of the Via Roma, up the roof of the Palazzo a Vela and around the rooftop test track of the Fiat Lingotto factory. In a famous scene, the MINI’s run down the steps of the Gran Madre di Dio church while a wedding is in progress. The drivers escape by driving through sewer pipes, eluding the police and make their final getaway driving up the back of a six-wheeled Harrington Legionaire-bodied Bedford VAL coach while it’s driving. After the gold has been unloaded, they push the MINIs out of the coach as it travels through hairpin turns in the Alps. The popularity of the film has led to parodies and other productions like the Italian Job remake. The U.S. version was made in 2003 and had an all-star cast including Mark Wahlberg and Charlize Theron. The plot was similar with a gold heist and of course a chase scene with the MINI’s. But these three MINI’s had to be modified in order to handle all the extra weight of the gold. Each MINI’s suspension was reinforced and a special compartment in the back was built to carry the gold bars. After blowing an armored truck through the street and down into the sewer system, the three MINI’s are filled with the gold bars, and end up in a pulse-pounding, pedal-to-the-metal chase that careens up and down the streets of Los Angeles. The fun video made by MINI, was directed by Top Gear’s lead director, Phil Churchward who does a good job of using London landmarks that are in the original 1969 film. And Park Lane Motors who played a key role in the original film is where the Britalian Job MINI’s are dispatched from. Daley Thompson, a British decathlete who won Olympic gold medals in 1980 and 1984, plays the dispatcher in the video. Thompson also broke the decathlon world record four times. The MINI’s are chasing a motorcycle through the streets of London going where only a motorcycle and MINI’s could go. After they finally catch the elusive motorcycle rider, the MINI drivers, who are British athletes, take off their helmets to finally get the gold they have been chasing. As the villain on the motorcycle removes the helmet, it is none other than fashion model-turned-actress Jodie Kidd. She is carrying the gold (medals) in a briefcase and the British get their prize. The cute blonde is a fan of racing and is one of the quickest celebrities around the Top Gear test track. Kidd has also participated in numerous Gumball 3000 rallies. The 2012 London summer Olympics start on July 27th and run through August 12th. Watch the fun Britalian Job’ and the three MINIs in the video below. 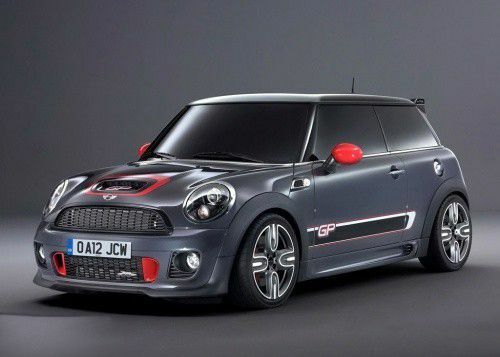 This story about the 2013 MINI JCW is updated on May 18, 2018.